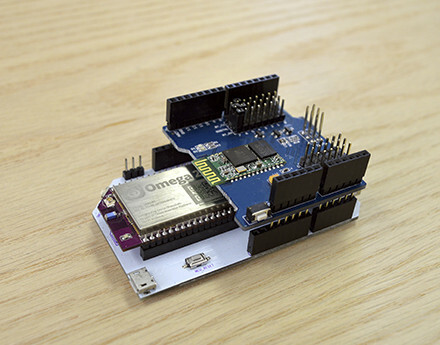 Onion Omega board was first introduced in 2015. The tiny OpenWrt Linux board featured an Atheros AR9331 processor with GPIO headers, and various baseboards and add-ons. The company has now launched a Kickstarter campaign for the second versions – Omega2 & Omega2 Plus – with a faster processor @ 580 MHz, compatible with docks and add-ons boards used for Omega, and a much lower price with $5 for the Omega2, and $9 for Omega2 Plus with more storage and memory. Although the module can be used own its own, it’s much easier and fun to use with docks with the Expansion dock, mini dock, power dock, or Arduino dock shown above, and combined with one or more add-on boards adding relays, OLED displays, servo board, Ethernet, Bluetooth, GPS, or 2G/3G cellular connectivity. The developers also partnered with ControlEverything to provide for sensors add-ons. Omega2 runs Linux, likely OpenWrt, and can be programming with visual editor like Node-RED, as well as programming languages like C, C++, Node.js, Python, and php. You can checkout their github repositories to see what they’ve done for the original Omega board. The campaign has reached its funding target within a few hours. Beside Omega2 and Omega2 Plus board, you may also consider get a bundle with a dock of your choice for $20 or $24, and various other kits are also offered as rewards. Please note that shipping is not included, and they’ll ask you to pay shipping later when the board is ready to ship with the price for the board only expected to be around $2 for most people, but it can be as high as $15 to some countries. Delivery is scheduled for November 2016. Thanks to Freire & Nanik for the tip. This does sound good but the price including the dock is quite high and without it it’s a bit useless ( it can’t even be easily powered without soldering from what I understand ). LinkIt Smart 7688 is cheap enough and it has include a ATmega32U4 chip. @Fan, actually Seeedstudio sells 2 versions of the Linkit Smart 7688, one with just the MT chip and the other, the Duo, with the ATmega for Arduino compatibility for about $2 more. What about the performance of running scripting languages like python/ruby/NodeJs on these MIPS based boards ? In my experience, they are utterly slow while executing big scripts. As example, python based “youtube-dl” on a AR9331 based router with 64 MB of RAM takes over 60 seconds to execute, perl scripts are even more slower. The campaign is almost finished, and they’ve raised over $600,000 with their $5 dollar board (and accessories). Not bad.